If you’ve read my previous blogs, you may know that I'm a flexitarian—meaning that I eat a plant-centric diet with occasional servings of lean meat, poultry, or fish—for most of the year. Now a new study finds that more people are taking my view. If you’ve read my previous blogs, you may know that I'm a flexitarian—meaning that I eat a plant-centric diet with occasional servings of lean meat, poultry, or fish—for most of the year. I also follow a strict vegan routine during the winter months. Though sometimes friends and readers question my choice to leave animal protein largely out of my diet, I've always explained that with careful planning, my eating habits are just as healthy, if not more so, than anyone else's. Now a new study finds that more people are taking my view. Vegetarianism is increasing in popularity in the United States, according to a recently published position paper in the Journal of the American Dietetic Association. Among adults, 2.3% of the population is vegetarian and 3% of 8- to 18-year-olds follow a vegetarian diet. That doesn’t sound like much, but—compared with just a few decades ago—there is a definite movement from Americans to give up their beloved burgers, at least some of the time. According to the American Dietetic Association's new position paper, released in July, "appropriately planned vegetarian diets, including total vegetarian or vegan diets, are healthful, nutritionally adequate, and may provide health benefits in the prevention and treatment of certain diseases. 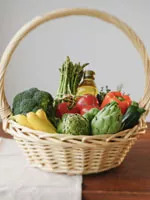 Well-planned vegetarian diets are appropriate for individuals during all stages of the life cycle, including pregnancy, lactation, infancy, childhood, and adolescence, and for athletes." Now it's up to the USDA to see if the many benefits of eating a plant-based diet are addressed in the next edition of the U.S. Dietary Guidelines, to be issued next year. Until then, it certainly can't hurt—and will most likely help your health—to try going meatless at least a few days a week. Here's how to make sure you get the nutrients you need, and here are plenty of tasty recipes to get you started.